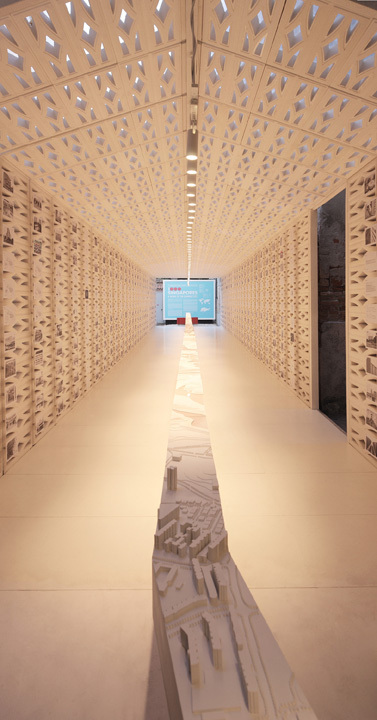 The exhibition 1,000 Singapores: A Model of the Compact City was designed and built for the Singapore National Pavilion at the 2010 Venice Biennale. 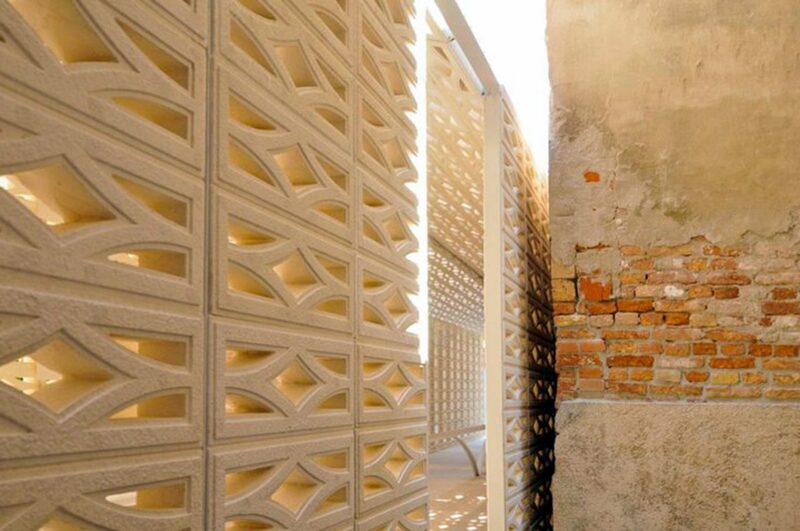 The architecture was composed with two differently scaled strategies—macro and micro. 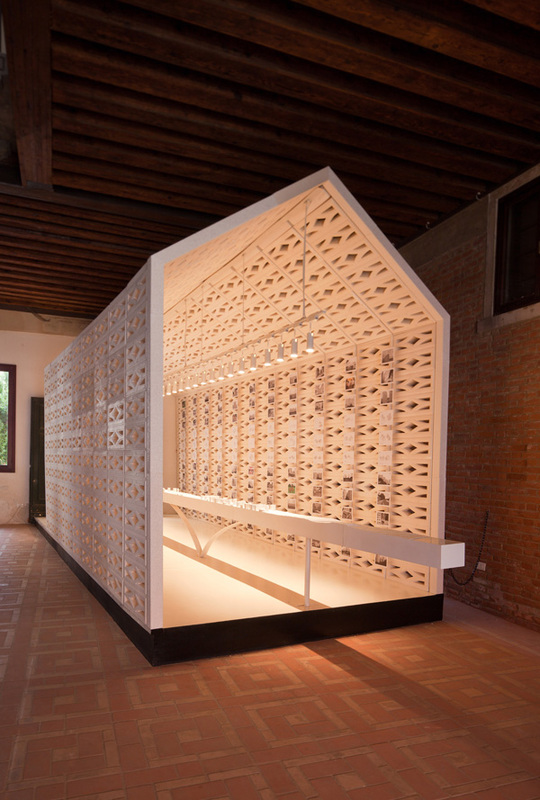 At the macro scale, a 30-meter-long trellis tube was positioned between an exterior courtyard and an interior gallery on the ground floor of the Istituto Provinciale per l’Infanzia. The tube wrapped a 35-meter-long ‘Singapore sample’ in the form of a long, intricate model—a slice through the nation state. Rendered in white ABS plastic, the slice of Singapore formed the primary spine of the exhibition. The tube was extruded between two end profiles, one rectilinear in shape and alluding to the public housing that accommodates 83% of the nation’s resident population, and the other taking the iconic pitched-roof outline of the residential house. While housing the exhibition content, the long tube also served as the only means of access into the interior galleries. The exterior end profile framed a view of one of Venice’s canals, bringing Singapore and Venice into visual proximity. The tube was bifurcated where it met the entrance to Istituto Provinciale—the very location where Vivaldi composed Le Quattro Stagioni (The Four Seasons). A wedge was subtracted from the tube at this threshold, allowing for expanded circulation while marking a kink in the plan. The design was purposely neither fully exterior nor entirely interior, rather composed of both qualities. Likewise, the design oscillated between being read as a temporary installation and a permanent spatial extension of the original historic architecture. At the micro scale, a series of metal frames ran the length of the tube forming its primary structure. Positioned between them were a series of EIFS polystyrene ventilation blocks placed in a stack bond configuration. Though referring to the tropical screens of Southeast Asia, the blocks produced an elongated veil, screening the exhibition proper. Light and air were permitted through, but views were obstructed. The veil, rendered in white stucco, was calibrated to the crisp Venice sun creating a subtle atmosphere of even natural lighting, gentle breeze, and dampened acoustics. 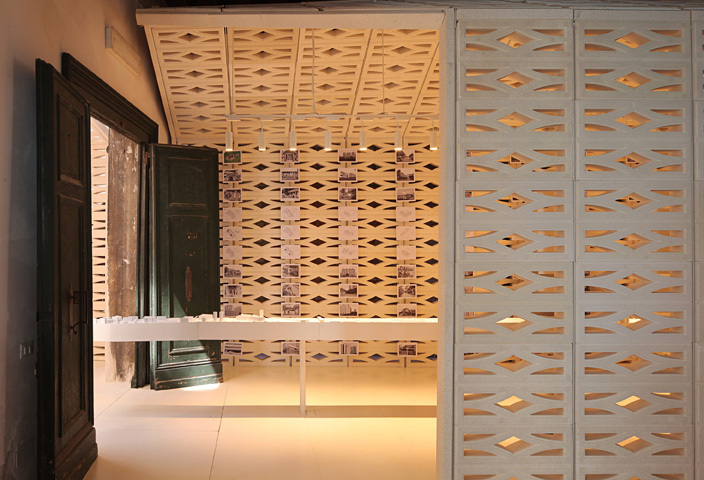 The architectural effect was a gallery-like setting where contemplation of the exhibition content was the priority. Within, 1,000 postcards were positioned around 6 inches (150 millimeters) proud of the screen. As such, focus was set off the elevations and the architecture could be perceived as a background—experienced in an unfocused state. Simultaneously, fragmented views could be seen through the blocks. Resultingly, the optical performance of the veil drove the phenomenological and experiential qualities of the design. 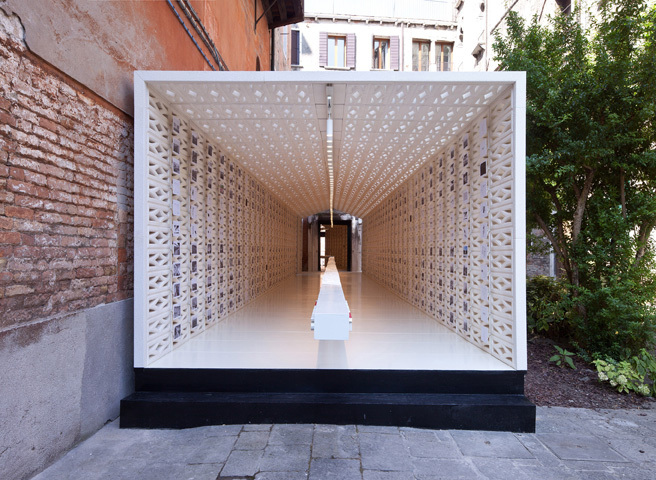 The architecture was fabricated in Singapore and shipped to Venice for installation. 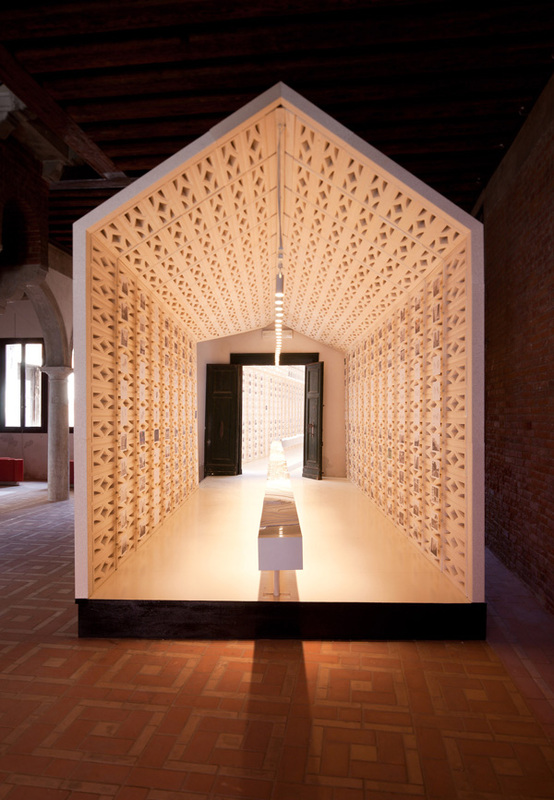 Weight, structural loading, and the logistics of transportation through the canals of Venice all drove a design subtext: a deployable modular system. At the exhibition’s close, the entire exhibition and architecture were repackaged and returned to Singapore in wait for its next deployment.